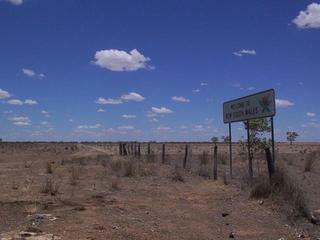 Coming from Cunnamulla, we arrived at the Mitchell Highway border crossing at about 12:45 p.m. Much of the Queensland – New South Wales border has a “vermin-proof fence” intended to keep dingos (an indigenous wild dog) off southern grazing country. As the border runs along the 29th parallel, there are heaps of confluence points along the fence. When I was planning this trip, my research lead me to believe that there was a maintenance track running along side the fence which would make this confluence easy pickings. I also noted the successful visit to 29°S 142°E by Pierre Gander and Brigitte Amrein who employed this same strategy. Unfortunately, at the Mitchell Highway gate through the “dog fence”, there was no such maintenance track making it next to impossible to approach this confluence from that point. Of potential interest to future visitors, the position of the “dog fence” at this point was slightly north of the the 29th parallel, indicating that attempts should probably be made from the NSW side. Based on the 1:250K topo map, a visit to the “Tuon” Station is probably the best option. #1: View towards the confluence along the "dog fence"
The demarcation line with Queensland is passing about 95 m north of the Confluence.